2004. 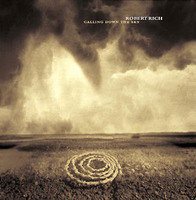 Robert's second self-released disc (following last year's well-received Temple of the Invisible) is a recording of a 2003 Denver concert -- ambient and atmospheric Rich sounds, similar to the Humidity release on Hypnos. This 74 minute live recording documents an entirely improvised concert in Denver CO, on Saturday July 26, 2003, with an intimate audience who came prepared for anything. With a thunderstorm forming outside, breaking to a peak mid-concert, this improvisation refered directly to the recent weather I had experienced on tour that summer. Below are two journal entries that might flesh out the meaning of the cover artwork, visually interpreted by John Bergin. I'm watching a giant storm cell bubbling to the south. My position eastbound on I-40 is perfect, at the edge of the storm avoiding danger, far enough away that I can observe the shape of the towering cumulonimbus with its top sheared off into ice crystals high up in the stratosphere; yet close enough to study the battleship green shelf of mammatus clouds overhead to my right, a clausterphobic ceiling textured underneath with curling roiling bruise-colored tubules, not unlike giant intestines. My sense of distance gets boggled by the size of this storm, on the horizon of a flat land, possibly centered 100 miles away, yet with tendrils that drop an occasional pocket of heavy rain and lightning on the highway in front and behind me. I'm mesmerized by the power and danger that this living entity represents, enchanted by its awesome beauty. Driving southwest to Peoria I hit the most intense weather I have seen yet on this trip. Blue-black clouds up ahead, deep opaque blurs underneath, telling me I'll hit heavy rain. I tune into the radio news, and listen to tornado warnings for the two counties north of me, with a tornado moving southeast. It'll probably miss me, since I'm driving west, but the weather looks big. The 18 wheel semi in front of me slows down as we approach a wall of rain. The driver turns on his hazard lights, and for 20 minutes those blinking red lights provide my only clue about the road. We're driving about 15 miles per hour through an airborne lake. Water hits the car so hard it's deafening, and the wipers prove useless. I feel like I'm driving a submarine. Common sense would have suggested I pull over and wait for the storm to pass, but I figure I'm OK as long as the truck in front of me stays on the road. Heavy weather tailed me during Summer 2003, as I circled the country giving concerts. From wind storms in the desert to tornadoes in the Midwest, flooding in the East and lightning on the high plains, the sky exerted its influence. All came into focus during this improvised house concert in Denver, a journey joined by a circle of 26 friends. A dialog between music and the elements took form like a shamanic exchange, an act of supplication in respect to stronger forces, calling down the sky to return a gift from the clouds.